New York City is an ideal place to commit any or all of the seven deadly sins - temptation looms around every corner. In learning about this cupola and its conversion to residential use, I have to admit I have committed at least one - envy (which I have been guilty of before). There are many of these magnificent, grand Beaux-Arts buildings around town with cupolas and there is a growing trend to develop and occupy the small handful of these domes available. See my posting here on the Police Building, a dramatic structure with an enormous dome (also converted to residential use). 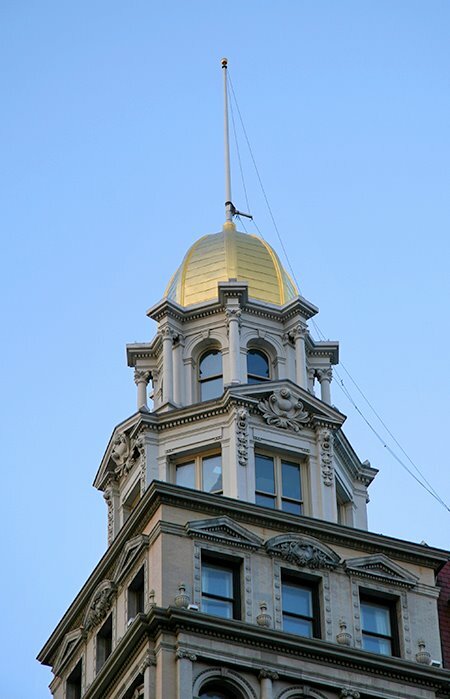 The photo is of the two-story, octagonal gold-leaf cupola atop the Sohmer Piano Building at 170 Fifth Avenue in the Flatiron/Chelsea District. Designed by Robert Maynicke and built in 1896 by developer Henry Korn, the 13 story landmark beaux-arts building was once a piano showroom. After residential conversion, the cupola was was purchased in 2001 by Gregory C. Carr, former chairman of Prodigy. Luxuria (Lust), Gula (Gluttony), Avaritia (Greed), Acedia (Sloth), Ira (Wrath), Invidia (Envy), Superbia (Pride). Each sin has an opposite among the seven holy virtues - in parallel order they are chastity, abstinence, temperance, diligence, patience, kindness, and humility.